Our Sounds for Alexa book includes 335 albums, of which 43 are self-made recordings, special promotional productions or audio books. The remaining 292 were deemed to have been commercially produced and widely marketed and therefore to have been reasonable candidates for inclusion in Amazon’s Music Unlimited library (which apparently contains some 40 million songs) which we now subscribe to. I successfully requested Alexa to play 189 of these, but the remaining 103 proved more problematic; either Alexa couldn’t understand what I was asking for or the album didn’t exist in the Music Unlimited library. By searching the Amazon web site I determined that while 62 were not available in the library, 41 were present and should have been accessible via Alexa. I tried requesting these 41 a second time, but could only get 14 of them to play. This leaves 27 albums which Alexa should be able to play but which I have been unable to make a successfull request for. These statistics hide an extensive and sometimes extremely frustrating set of interchanges with our new house lodger. An example at the straightforward end of this spectrum was a request for the album ‘The Carpenters’ by The Carpenters which consistently resulted in the album ‘Carpenters Gold’ being played. On reporting this foible via the feedback mechanism in the Alexa app, I received a very prompt reply from Amazon Customer Services confirming that this was incorrect and advising that the technical team had been informed. Perhaps less easy to understand, however, were the 8 albums which Alexa seemed to have understood what I had requested (she repeated the words back to me correctly), but said she couldn’t find the albums despite the Amazon website saying they were available in Amazon’s streaming service. For the remaining 18 albums, Alexa just couldn’t seem to understand what I was saying. Sometimes she got close as, for example, with East of Eden’s ‘Mercator Projected’ album, she repeated ‘Mercato Projected; and for the album ‘Fongo’ by Los Chinches, she repeated ‘Fungo by Les Chinchillas’. For other albums, she was just way off as with Peter Sellers’ ‘Fool Britannia’ which she repeated as what sounded like ‘full returning to bratamella’. For most of the problem items I had at least two or three goes each time, and sometimes Alexa simply got worse and worse rather than better and better. For example, Alexa’s first attempt at Tom Russell’s ‘The Rose of Roscrae’ was ‘rossel rescit’ and the second time around she moved on to ‘the runners of roscrae’. Likewise her first attempt at the album ‘Let Spin’ by Let Spin was ‘ led span by led spain’; followed up with a second attempt in which she started playing Felice Civitareale’s album ‘Let’s go to Spain’. Such interactions in the end become rather tiresome because the exchanges are all one-sided. Alexa doesn’t pick up on cues like a hoot of laughter at what she is saying, or the tetchiness in one’s voice as you say the same thing yet again. Of course, in normal day to day use, one wouldn’t be going through a whole list of problem items, so its unlikely that one would experience so many consecutive unsuccessful interactions. After all, Alexa’s overall success of playing 203 of the 230 albums that I believed she should be able to play, seems pretty good. However, this exercise has clearly highlighted the fact that the system has not yet been perfected. Furthermore, as well as the basic voice recognition issues, there are also a couple of other functionality shortcomings which Amazon hasn’t addressed – first, for albums consisting of more than one disc, there appears to be no way of specifying that Alexa should start playing Disc 2 as opposed to Disc 1; and second, there is no way of getting Alexa to move directly to a specific track number. This item is part of the digital collection and can be heard by playing it on the iPhone; or through Alexa’s speakers by setting up a Bluetooth connection between the iPhone and Alexa. It is not available through Amazon’s Streaming Service. This item is available in Amazons streaming service and can be listened to by requesting Alexa to play it. Even if this album is not available in Amazon Music, it may be possible to get Alexa to play individual tracks from the album because they may be present in other albums which are available in the Streaming Service. 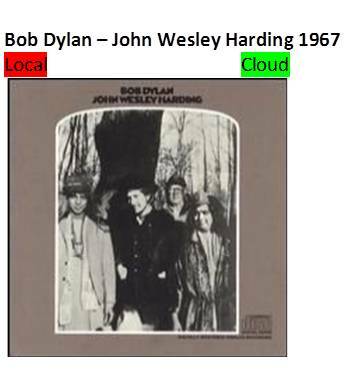 In the book, I have placed these icons directly between the album’s name and it’s cover art – as shown in the example below. Note that an album can have all or none or some of these icons. I decided that I would allocate a Cloud icon to those 27 problem items which I have been unable to get Alexa to play, on the basis that they are available in the Streaming Service and that one day Alexa may be able to play them. With all the allocations complete, it was time to complete the printing of the book and to take it into bookbinding – more of this in my next entry.